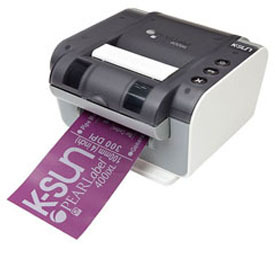 K-Sun PearLabel 400iXL General Label & Shrink Tube Printer - The 400iXL is a versatile cartridge based, wide-format thermal transfer printer that prints on adhesive tapes and wide-format heat shrink tube. With 5 ribbon cartridges to choose from, you can quickly and easily make 2-color or multi-colored labels on demand. Each 400iXL comes with K-Sun's MaxiLabel Pro software, which is included FREE. It is now very affordable to make labels for a variety of industrial labeling needs such as wire-marking, safety signs, GHS labels, ANSI / OSHA labels and much, much more. Includes: PearLabel 400iXL Printer, MaxiLabel Pro Ver 5.0 General Labeling Software, USB cable, Power Adapter, (1) 4" x 49' White Roll, (1) 4" x 98' Black Ribbon.